Here's a good example of Archimboldo's work. This is called "The Vegetable Bowl". As the Roman Republic expanded and grew into an empire, they absorbed many foreign belief systems into their own with the Greek pantheon being the most obvious. When the United States was a burgeoning country, Samuel Francis Smith wrote the lyrics to “My Country tis of thee” but ironically used the melody to “God Save the Queen”. 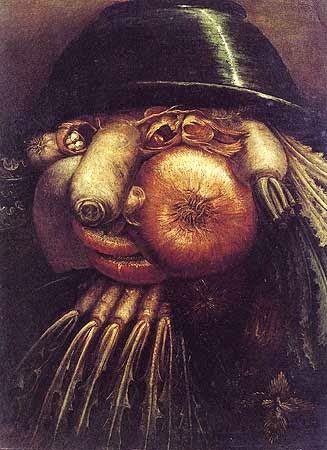 Giuseppe Arcimboldo. a 16th century painter, fascinated Salvador Dali and other surrealists. 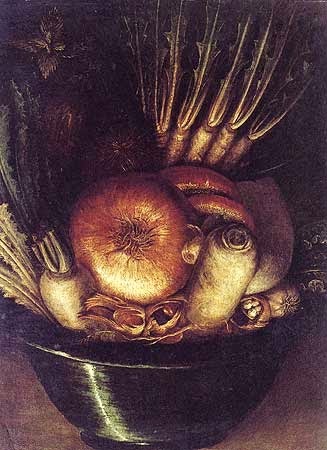 Sali borrowed Arcimboldo’s idea of hidden faces and expanded it into hidden pictures in many of his works. In the early 2000s, fashion designers mysteriously decided to bring back the 1970s, leading to bell bottom jeans and platform shoes becoming popular again. Here's the same painting, only turned upside down. Now it's called "The Gardener". The Christmas season is also borrowed, though the borrowing took place centuries ago. The Romans, the Germanic pagan, the British druids, and the Nords all contribute to our present day celebrations. In Roman mythology, Saturn (Latin: Saturnus) is the father of all the gods, equivalent to the Etruscan Satre or the Greek Kronos. Worshipped for several centuries, Saturn not only had a vast array of myths, but he also was the god of plenty, wealth, generations, peace, the harvest, and time. Actually, ancient man attributed Saturn with more characteristics. But these characteristics are relevant to Saturnalia. The Romans celebrated Saturn and the anniversary of the Temple of Saturn with a multi-day festival. The length of the festival changed over the centuries, from as short as three days to as long as a week, but generally Saturnalia started on December 17th and ended around December 23th. Saturnalia occurred after the harvest, before the next crops began to show. On one hand, the celebration was an entreaty to the sun to rise again, to help the next crops grow properly. On the other hand, the celebration marked the beginning of a new year, as the days began to lengthen again. Both reasons fit Saturn since he oversaw the harvest, prosperity, and time. During the celebration, the government effectively shut down. The courts did not hold session, exercise regimens were cancelled, schools were closed, and people dressed in bright clothing. Roman citizens all wore a pileus (pictured left), a felted hat normally worn by freed slaves. This practice made everyone visibly equal, another facet of Saturnalia. For those brief days, slaves and masters were more equal. Slaves were allowed to play dice, gamble, and freely speak their mind. Some formed groups that roamed around, singing jovial songs. Another aspect of the closed government was that government officials could not declare war. For a few short days, the Roman Empire lived in peace. Romans spent the last day of Saturnalia, called Sigillaria, giving gifts to their friends, family, and sometimes enemies. Journals and diaries that survive from that time show that the gifts varied, from money to clothing to jewelry to joke gifts. Sometimes a verse or two accompanied the gift. The last day also included a feast for the slaves and masters. First, the slaves dressed in their best clothes, and were served a brilliant feast. Afterwards, the slaves changed clothes and served the master his feast. If a master had enough money, he sacrificed a suckling pig for the meal. From Saturnalia, we get a multi-day celebration, wearing special clothing, exchanging gifts, exchanging cards (verses), wearing a stocking cap, taking a break from work, Christmas dinner, Christmas caroling, and the Christmas ham. Immediately after Saturnalia, on December 25th, the Romans celebrated the birth of two separate sun gods - Sol Invicti and Mithras. The worship of Mithras began sometime in the first century, rose to its peak in the second and third centuries, and died out in the fourth century. Not much is known about Mithras, but we do know he’s somehow related to Mithra, the Zoroastrian angel of covenant and oath. Mithra became Mithras, a Persian sun god, and then a Roman sun god. The Romans celebrated the birth of Mithras, a man wearing a Phyrgian cap emerging from a rock, on the same day of the birth of Sol Invictus. Sol Invictus was the official sun god of the Roman empire starting in 274 AD, though there is evidence of his worship from 102 AD to the fifth century. Emperor Augustine warned people against the worship of Sol in the fifth century. 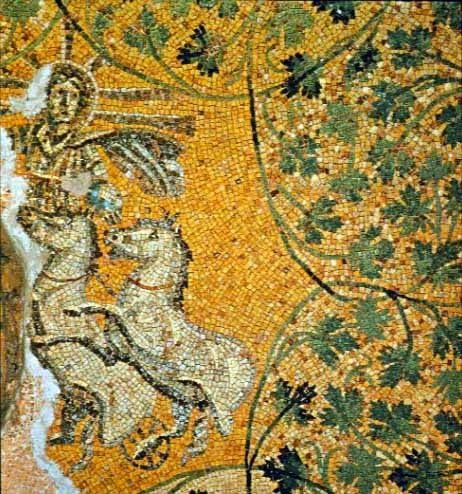 Supporting this theory is this mosaic of Christ as Sol Invictus as pictured above. This mosaic is in the pre-4th century necropolis under St. Peter’s Basilica in the Vatican. Yuletide was a winter solstice celebration of the ancient Germanic people. This celebration encompassed a tribute to Odin (Jul or Yul), a belief in the Wild Hunt (a possible explanation for the Northern lights), a yearly return of draughar (undead beings that walked the earth), feasting, and drinking. Yule was a time of hope, as people looked forward to a return of longer days and spring. While we don’t have exact dates for this festival, Yule took place for approximate 12 days. Some believe the celebration went on for as long as the yule log burned. Regardless, scholars connect this to the creation of the 12 Days of Christmas. 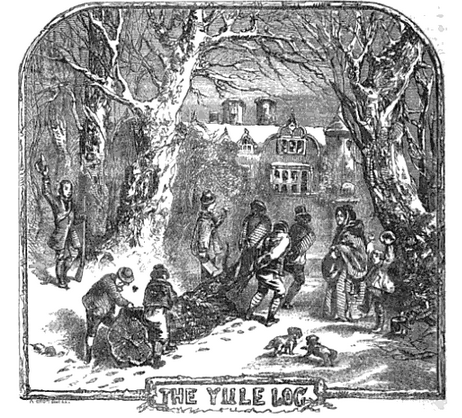 The Yule log originated in the Germanic pagan custom of cutting down a tree for warmth throughout Yule. They brought the tree into the house and burned the trunk. Some scholars believe that the celebrations lasted as long as the log burned. Regardless, this tradition made its way into Anglo-Saxon rituals, where people burned a yule log during winter solstice and decorated an evergreen tree to signify the continuation of life. The Germanic pagans and British druids believed that a sprig of mistletoe hanging over the front door brought good luck and health. Other pagan cultures thought mistletoe represented divine male essence, so hanging a sprig of mistletoe brought virility, health, and a good harvest. The Yule boar was an offering to Freyr, a god in the Germanic Pagan Pantheon responsible for fertility and the harvest. This turned into the Christmas ham, though early Church elders used the eating of the ham as a test for people converting from Judaism. The Yule Goat is one of the oldest symbols in pagan and Christian mythology. Scholars believe it might have started with the god, Thor, who rode around in a cart pulled by two goats. Regardless, the Yule goat represents both wassailing (or “going Yule goat” as they still say in Scandinavia today) and gift giving (the invisible Yule goat went around the village, delivering presents to the good people). The picture above shows Father Christmas riding around on a Yule Goat, delivering food and presents to the villagers. 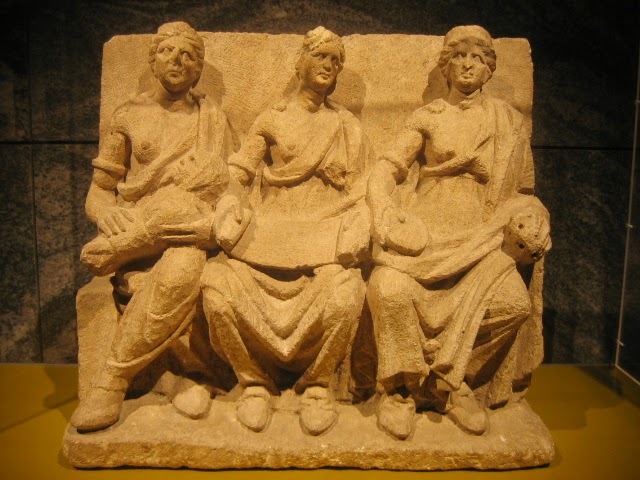 Mōdraniht, Old English for “Night of the Mothers”, was an event celebrated on December 24th by Anglo-Saxon pagans. From what we know, the pagans first built an altar, then set up candles, gave votive offerings, and prayed to the Mother Goddesses. A feast and an honoring of one’s own mother followed. As part of the Anglo-Saxon pagan winter solstice traditions, serfs and peasants went around singing to the lords and ladies of the land, a tradition called wassailing. There were two types of wassailing: one at a lord’s manor and one at the orchards and fields. At the manor, the singers expected food or treats after singing. In the orchards, the singers sang to the trees to help the upcoming harvest. The pagans in Northern Europe celebrated winter solstice with evergreen trees and wreaths. Evergreen represented life, with wreaths a symbol of the circle of life. As people who lived off the land, they depended on the circle of life for food. In some parts, the trees and wreaths helped keep demons at bay, and represented happiness and warmth as the shortest, darkest day of the year passed. The original bearded man who flew around delivering presents was not St. Nick, but Odin, the Allfather from Nordic mythology. Carrying a spear and wearing a cloak, Odin rode across the sky on an eight-legged horse called Sleipnir during the Yule, delivering gifts to good people. He learned about the world, including who had been good and bad, through his black ravens, Huginn and Muninn (Old Norse for ‘thought’ and ‘memory’). The Nords also credited Odin with gifting them a rune alphabet. When the Catholic St. Nicholas moved from southern Europe to northern Europe, he changed into Sinterklaas, merging the Christian rituals with the Nordic traditions. Sinterklaas had a big beard, wore a cloak, carried a staff, rode a white horse across roofs, and gave out chocolate letters to children. Sinterklaas also had black-faced elves who peered down chimneys, spying on who was good or bad. When the Dutch brought Sinterklaas to the New World, the name became anglicized into Santa Claus. The Anglo-Saxon traditions own much to Odin as well, though under the name of his counterpart, Wodan. A major deity in Anglo-Saxon polytheism, Wodan traveled around wearing a cloak and carrying either a spear or a staff, riding a white horse, and blessing the harvest during the winter festivals. Wodan appears in many folktales and legends through the Middle Ages and beyond, giving rise to the mythology around Father Winter and Father Christmas. The Christmas season reflects the traditions and rituals passed down through mankind’s written history. From evergreen wreaths to gift-giving to Santa, man takes his ancestors’ ideas, incorporating and interpreting them to fit the current times. Today, we have new traditions, such as the Elf on the Shelf and websites that follow Santa as he delivers his presents. One of these websites, run by North American Aerospace Defense Command (NORAD), not only tracks Santa but also loads images of various geographic landmarks that Santa flies past. Maybe in the future NORAD’s website will start a tradition of learning about other cultures or other parts of the world. Or maybe our modern society can emulate the Romans and forbid war the Christmas season. Soldiers did that a few time during World War I in what we now call the Christmas Truce. In 1914 and 1916, both the Allied forces and the German forces set aside arms, exchanges presents, sang songs, and ate dinner together. For one precious moment, differences were set aside and shared humanity took center stage. In the end, the Christmas (winter solstice) celebrations embody an optimistic hope for the future. In the past, the hope was for a good crop, healthy animals, and good weather. During World War I, the Christmas truce represented hope for the end of the war. Now, the celebrations are hope for a better future, where peace and prosperity reign, people learn to debate instead of argue, and the world becomes a better place. What do you hope for this Christmas season?